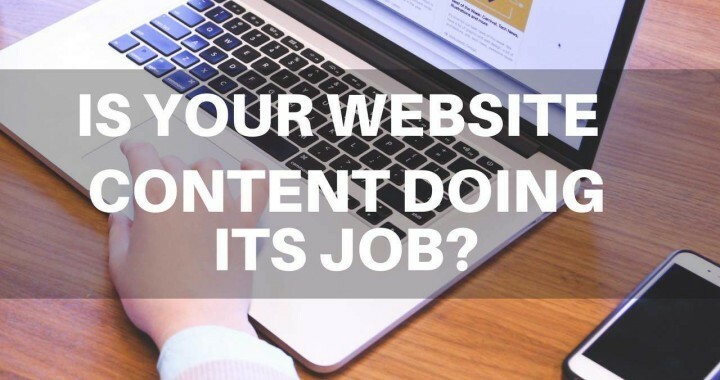 Is Your Website Content Doing Its Job? Making sure your website content is in order is important not only for SEO purposes but also for helping convert visitors on your website into leads or sales. In our Ultimate Website Planning Guide chapter on Content is King we talk about the importance of planning and creating quality content. To help you get your website content in order, we have put together a website content checklist for you to work through. 1. Is your website content unique? Unique website copy exists only on that page on your web site and does not live anywhere else. If your website copy or product descriptions exist on other websites, it is a signal to Google that your content and your web site are low quality. Did you copy your site text across multiple different websites? Do you allow other websites to copy and republish your blog posts and content to their websites? If you run an e-commerce shop, do you just use and copy the product descriptions from the manufacturers website to your site? If you are a wholesaler, do you allow your online retailers to use the product descriptions from your site on their website without making changes? If you do any of these things, you need to stop doing them as they will impact the performance of your site in Google search. 2. Is your website content comprehensive? The goal here is to ensure that your page has sufficient detailed website copy on it to allow Google to distinguish it from any other web page on your website. If your web pages do not have comprehensive web copy on them, then they may be considered "thin content" by Google. This means that Google may not deem your website pages to be important enough to be included in the Google index and ranked for any searches. What does not having comprehensive copy look like? All you need to do is make sure that there are enough words on the page? How many words are enough? Well, it depends. It's accepted that between 300 and 500 words is enough to make a page unique. Remember it's important to consider how many words there are already on your page BEFORE you add content. The words in the navigation, the site bar and the footer of your web page template are repeated across all pages. If there is a lot of copy in the template alone, this just means you need to add more web page text to make sure your page is comprehensive enough to be unique. If your most relevant pages, the ones you want to rank and get found have insufficient words on them, say less that 300 words, then you should start adding additional, keyword rich, compelling web copy to those pages. 3. Does your copy target a specific audience or customer? The goal here is to ensure that your website copy is written with a particular customer in mind. One with a specific set of problems. By having an understanding of who your target customer is your web copy will speak to their problems and fears and position your products and services as a solution to their problems. Do you have a mental picture of who your ideal customer is and what their primary problem is that you are trying to solve? Have you looked at your current clients and identified any that are the exact match for your ideal customer? Does your website copy explain how your product or service can help that person solve their problems? Do you have other resources on your site, whether content, tools or checklists that are created to help educate your target customer? Do you have case studies from your ideal customers on your website where they talk about how your product or service helped them? If you have not done any of this, then you need to spend some time thinking about your ideal customer, what their problems are and how your web copy can tell them that you are the solution to their problems. 4. - Do you have conversion content on your site? Does your copy tell people who you are and how you can help them? It's imperative that your website copy helps people to make In the decision to do business with you. I like to call this type of content "Conversion Content" as it helps people move along the path to becoming customers. Do you have a comprehensive About Us page that explains who you are, your skills and your experience and how you can use your skills and experience to solve your customer's problems. Do you have information on your site about how your products or services assist in resolving peoples problems? Do you have helpful content like tools, checklists, whitepapers, explainer videos, trials, that help demonstrate your competency and explain your approach to solving their problems? Do you talk about the particular market you serve, the people you help so that people visiting your website can determine quickly whether you are the person they should be doing business with? 5. - Do you have a call to action? All of your marketing activity will bring people to your website. Make sure that you have the requisite calls to action to get people to do what you want them to do. A prominent, targeted statement, offer or question that compels your visitor to convert into a lead or a sale. WHY HAVE A CALL TO ACTION? You need to have a call to action to get the website visitor to take a step closer to becoming a customer. Remember that very few people buy from you the first time they visit your site so not all calls to action are "Buy Now". It makes sense to include smaller calls to action on your site like asking them to follow you on social media or signing up to your newsletter. Once you have them on your email list, you will be able to follow them then up with automated email marketing and paid advertising to continue the relationship and demonstrate your ability to help them. Buy Now/Order No/Get Started: buttons: On pages where people are expected to make a purchasing action, it should be obvious how they do this by having prominent buttons that have action focused text on them. Lead Magnet: A lead magnet is a piece of content that you give away in exchange for an email address. This allows you to contact them using their email address. A lead magnet should be helpful and compelling and distinct. Tell them the benefits of signing up and how to get access to the content. You can read more information on calls to action in the links at the bottom of this post. When reviewing all your content for relevance, uniqueness and that it is targeting your audience, you also need to make sure that the content you produce is displaying and being consumed correctly on all devices. Heavy, clunky content that might work well on Desktop might be an obstacle to users on phones. If you have an audience near or over fifty percent that is using phones, you can't afford to have content that is blocking them from using your site. Use a mobile device emulator, like that provided by MobileMoxie, which allows you to render your pages easily on different devices and see in real time how your content looks and feels. Content maketh the site! Making sure you put quality time into your content is as important or more so than the design. Getting the website found, appealing to your audience and creating contact from your audience is not something you should take lightly. I'd love to hear your thoughts on what content challenges you have with your site, and how to help improve how you use content to improve your website results.